Recruited by his old hitting instructor Roger LaFrancois, Bob Zupcic first turned down, then accepted the job as player/coach for the independent Bangor Blue Ox in May 1997, according to The Bangor Daily News. "This is a good opportunity for me. We love the New England area. I still love the game," Zupcic told The Daily News. "I still feel I can play (in the major leagues). I want to help the team win, keep my foot in the door, and see what happens." Zupcic was entering his 11th season as a player in a career where he spent parts of four of those seasons in the majors. His last time there came in 1994. He didn't get back. Zupcic's career began in 1987, selected by the Red Sox in the first round of the draft out of Oral Roberts. He played that year at short-season Elmira, hitting .303. He made AA New Britain in 1989 and AAA Pawtucket that same year. He got two hits and four RBIs in an August game at New Britain. 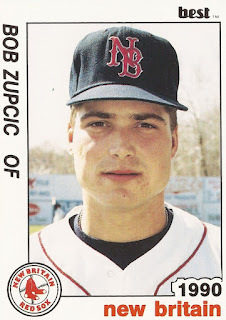 Zupcic debuted in Boston in September 1991, getting into 18 games and hitting .160. He hit his first home run in a late September contest, and was promptly met by a fan on the base paths. "He was there," Zupcic told The New York Times after the game, "so I gave him a high-five." In 1992, Zupcic became a regular, getting into 124 games and hitting .276. That May, Zupcic made a diving catch The Hartford Courant called sensational, helping the Red Sox preserve a 6-5. "I had a good jump and thought I could get it without diving," Zupcic told The Courant. "But the ball was hit so hard that I had to leave my feet. It was a reaction play. I didn't have time to think." He it his first major league grand slam in late June, against Detroit, to win the game. In September, Zupcic was winning a game in the 15th inning with a squeeze bunt. "Sure, it's nice to be a hero with a base hit or the home run, but Butch knows I can bunt real well," Zupcic told The Associated Press, referring to Red Sox Manager Butch Hobson. In 1993, Zupcic got into even more games, 141 games, hitting .241. In late May, it was a Zupcic double that helped Boston to a win in the 10th inning. He played four more games for the Red Sox in early 1994, before being taken off waivers by the White Sox. He made it to Chicago by mid-May. "I think I have the capability of driving the ball," Zupcic told The Chicago Tribune after getting called up to the White Sox. "I haven't really proven it in the big leagues." Zupcic, however, got just 32 games to show that. He hit one home run, bringing his career total in 319 games to seven. Zupcic then returned to the minors, playing in four different systems before signing with Bangor in 1997. He played just 25 games that year with the independent Blue Ox. By July, he retired. "The last two years have been a struggle as far as trying to get consistent with my play," Zupcic told The Daily News after his decision. Back problems helped him decide to end it. "With my back this year, I couldn't even hit 75 mile-an-hour fastballs."